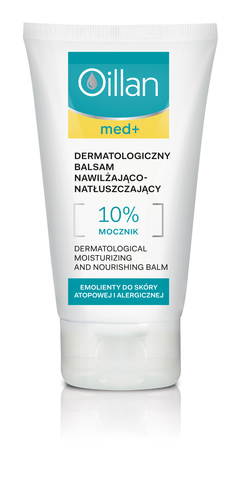 The balm is intended for intensive moisturization and lubrication of the skin: very dry, irritated, itching, too cornified, with diagnosed dermatoses (AD, psoriasis, ichthyosis). To be used in acute skin conditions, as well as in remission. Intended for children from the 1st month of age and for adults. Urea 10%, lactic acid, L-arginine, vitamin E, D-panthenol. relieves the symptoms of excessive cornification. Apply thin layer on clean and dry skin. Use once or twice a day, or more often, as needed. Caution: do not use in case of sensitivity to any of the ingredients. Aqua, Urea, Caprylic/Capric Triglyceride, Petrolatum, Coco-Caprylate/Caprate, Ethylhexyl Stearate, Propylene Glycol, Cyclopentasiloxane, Sodium Lactate, Arginine, Lactic Acid, Cetyl PEG/PPG-10/1 Dimethicone, Cera Microcristallina, Hydrogenated Castor Oil, Tocopheryl Acetate, Panthenol, Allantoin, Sodium Chloride, Hydroxyacetophenone, Phenoxyethanol, Ethylhexylglycerin.